Who are the top 25 wealthiest families in Canada? The ones with a net worth of billions of dollars? Yes, that would be Canadian dollars, but they’re still very, very rich. And are there many first-generation immigrant families among the top 25 wealthiest families in Canada? The answer to that last question is not many, but there is a handful. In fact, 2 of the top 10 wealthiest families are based on businesses founded by first-generation immigrants. Want to know who got off the boat and founded a business that would one day be worth billions? Let’s check out the top 25 richest broods of Canada. Not surprisingly Ontario takes the lion’s share of plutocrat predators. Quebec and Alberta fight it out for second place, while B.C. 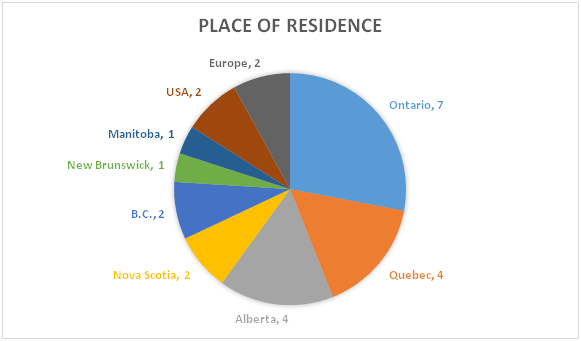 and Nova Scotia share the 3rd spot as far as Canadian places of residence. Manitoba and New Brunswick split 4th place between them. Finally, the USA and Europe each have 2 top 25 wealthiest Canadian families. As with your average skilled immigrant, it usually takes a few generations to establish a successful business in Canada. Especially one that ends up with a net worth in the billions of dollars. Here’s a look at how long Canada’s wealthiest families have been Canadians, from the wealthiest to the 15th wealthiest family. What this shows is that the closer to the top of the list, the longer the families have tended to live in Canada. It also shows how long they lived in Canada before the founding generation. 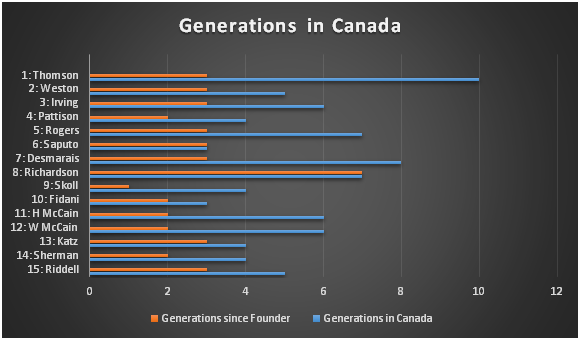 If the orange line is equal to the blue line – for example in the case of the Richardson and Saputo families – then the first member of that family to immigrate to Canada also started the family business. As you can see, not only do they live from coast to coast, but they are all billionaires. While they might not be world-class billionaires – with the exception of the Thomson family – they are wealthy beyond our dreams and have mostly managed to steer their companies through changing times and fortunes. And that’s never been more true than nowadays, when companies can rise and fall within a single generation of owners. You have to hand it to our humble little group of Canadian top 25 wealthy families: they’ve managed to paddle through more than a few rapids over the years and never let their well-laden canoes lose their precious cargo. Or if they have, they know how to right the canoe and portage a ways until they see smoother waters. But guess what? They also know there’s a whole new generation of Canadians – many from abroad – who are coming downstream behind them. It’s not easy to get established in Canada, but the rewards for persistence and talent and courage can be overwhelming. Who Got Off the Boat and Built an Empire?